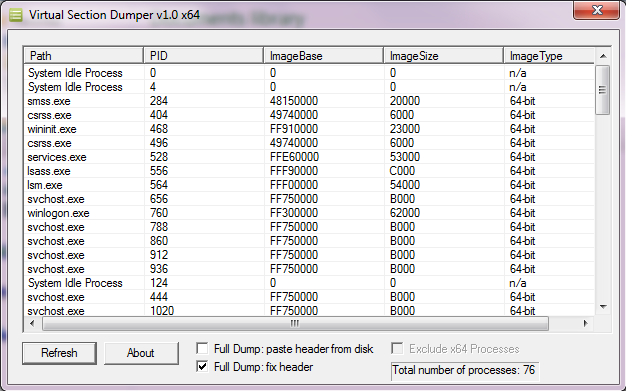 VSD (Virtual Section Dumper) is intented to be a tool to visualize and dump the memory regions of a running 32 bits or a 64 bits process in many ways. For example, you can dump the entire process and fix the PE Header, dump a given range of memory or even list and dump every virtual section present in the process. Added "Ignore unnamed objects" in the window handles. Added a module list viewer. Added Dump Full and Dump Partial over a specific module. Added sorting feature in the module list viewer. Added a handle list viewer. Added sorting feature in the handle list viewer. Added a thread list viewer. Added Resume, Terminate and Suspend functions in the thread list viewer. Fixed a bug in the PastePEHeader() function when calculating the offset of the original PE Header.